Does name recognition equal success for a filmmaker? Everyone knows who M. Night Shyamalan is and the guy has not made a film worth a flying fart in 13 years, and even that is debatable since I have plenty of issues with the movie about super smart aliens scouting out our planet to take it over only to have the thing that covers 70 percent of it be what kills them. I mean, it falls from the sky on a semi-regular basis. You would think they would abort mission the first time they melted in a downpour. Michael Bay is the fourth highest grossing director in cinema history and he has made three films worth a damn, and even that number isn't said with confidence because that is including the first Transformers which isn't exactly good, but I will admit I enjoy it. So here is a name for you, and I want you to write this down: Jeff Nichols. If you approached 10 people on the street and asked them who Jeff Nichols was, I would be willing to wager that no more than 2 would have even the slightest idea. This needs to change. In 2011, a film called Take Shelter was released and it is absolutely masterful, a brilliant and important look at mental illness. In 2013 we got to lay eyes on Mud, a passionate and beautiful tale about a man on the run who asks two boys to assist in reuniting him with the love of his life. These two stunning films are in my Blu-ray collection and thus I declared myself a Nichols enthusiast, but it felt incomplete. I had to watch his debut feature from 2007, a little slice of magic called Shotgun Stories and I will be honest, it is the worst of his three so far, although worst isn't a fair word to use. Here, this sounds better: Shotgun Stories is the least amazing of his work to date. This is the type of movie that you feel bad ranking last on any list because it is far better than the career bests of many directors. Nichols casts this spell over me that is hard to even put into words, so instead I can just describe what I experience as I witness his craft. When a gust of wind flows through the frame, it cools me down on a warm day. When a character feels emotional anguish or physical pain, I am overwhelmed by it as if it was my own. His handle on storytelling is sublime, as Nichols is able to develop even the simplest of characters and make their plights feel real and honest. 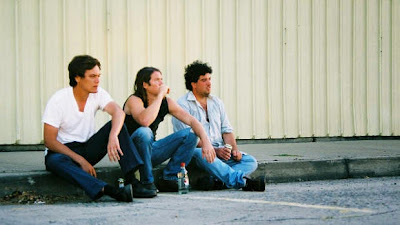 Shotgun Stories is about three siblings that go by the names Kid (Barlow Jacobs), Boy (Douglas Ligon) and Son (Michael Shannon). They attend the funeral of their father but not to pay their respects but rather to voice their disgust with who he really was while his other family members sit in tears. He abandoned them and hurt them, and Son literally spits on his grave. This doesn't make their half brothers very happy, as they knew their father to be a very different man. A man they cherished. This sparks a battle between the groups of men that leaves some of them dead and all of their lives shattered. The sins of your father live on long after he is gone. Nichols and Michael Shannon have developed quite the working relationship as they have collaborated all four times Nichols has stepped behind the camera, including the movie to be released later in 2015 called Midnight Special. It's easy to see why as Shannon is easily one of the finest actors working today, and if you want to see a perfect example of a performance being ignored by the Oscars when it was more than worthy go check out Take Shelter. Not everyone shines in Shotgun Stories, some of the other characters deliver their dialogue in clunky, almost robotic tones that feel unnatural, but Shannon delivers top notch work as always. Remember the name Jeff Nichols and seek out all three of his movies before Midnight Special hits theaters later this year. This is a man becoming one of the finest filmmakers working today, a man worthy of far more attention than some of these turds whom can barely piece a coherent story together. Put back your DVD of Armageddon or Pearl Harbor or Signs and seek out something different this time. Find a way to see Shotgun Stories.